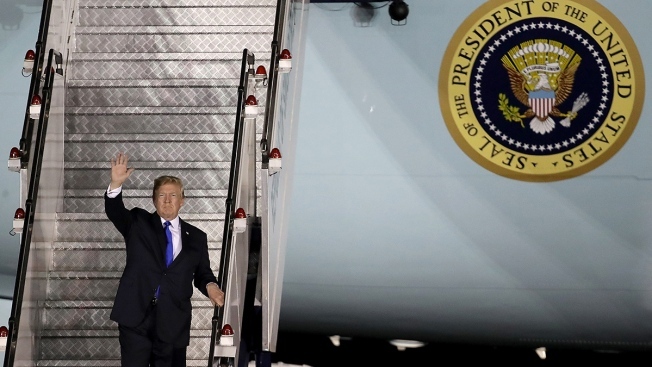 FILE - U.S. President Donald Trump arrives aboard Air Force One at Paya Lebar Air Base, June 10, 2018, in Singapore. A comedian pretending to be Sen. Bob Menendez, D-N.J., says he talked on the phone with President Donald Trump earlier this week in an epic prank call during which the president discussed a range of policy topics. John Melendez, best known for his six-year stint on "The Howard Stern Show," when he was known as "Stuttering John," revealed his alleged talk with Trump on his podcast, "The Stuttering John Podcast." Melendez said he connected with Air Force One Wednesday night after claiming to be Menendez. NBC News has not confirmed that the call took place or that the voice was that of Trump. The White House did not comment on the call, but notably did not tell reporters that the comedian's account was false.